The individual trap events at the 2018 ISSF World Championships concluded last night with the USA taking two more medals. The Junior Men’s Trap event ended first with the team of Logan Lucas, Dale Royer, and Mick Wertz finishing in 4th place with a score of 343, just 3 targets off the podium. Logan found himself in his first ISSF Final wearing bib #1 after shooting the top score of 120/125 and beating Turkey’s Murat Ilbilgi in a shoot-off 9 to 8. He would go on to take the Silver Medal after a close final that saw two shooters eliminated by bib number. First was Portugal’s Manuel Vieira Da Silva (bib #5), who was knocked out in 4th place after dropping his 35th target to tie bib #4, Italy’s Lorenzo Ferrari. Just 5 targets later, it would be Ferrari’s own bib number that would leave him in the Bronze Medal position after he was able to draw even with Lucas. 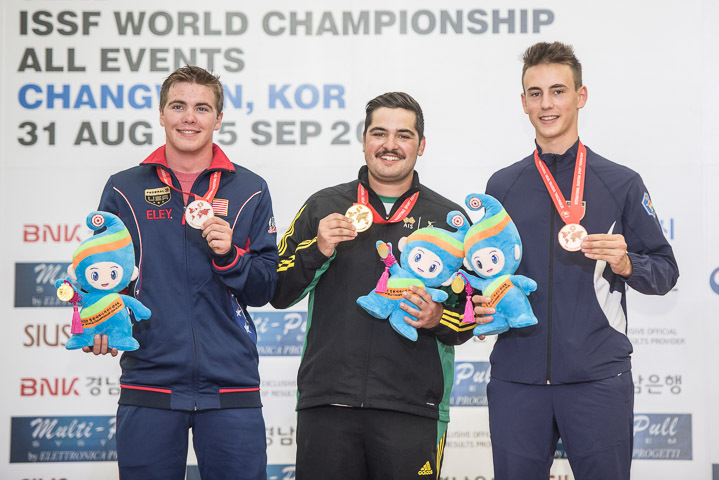 Even though Logan ran his last 10 targets of the final, it wasn’t enough to catch up to Australia’s Nathan Argiro, who would go on to with the Gold Medal with a final’s score of 42 to Logan’s 41. The second medal of the day went to the Women’s Trap team of Kayle Browning, Ashley Carroll, and Aeriel Skinner. Kayle and Ashley would both finish with a score of 114/125, while Aeriel finished with a 111/125. This would be good enough to give the team a Bronze Medal with a score of 339, 3 targets behind the Silver medal winning Spanish team, and 4 targets back from the the new world record holder and Gold medalists, Italy. 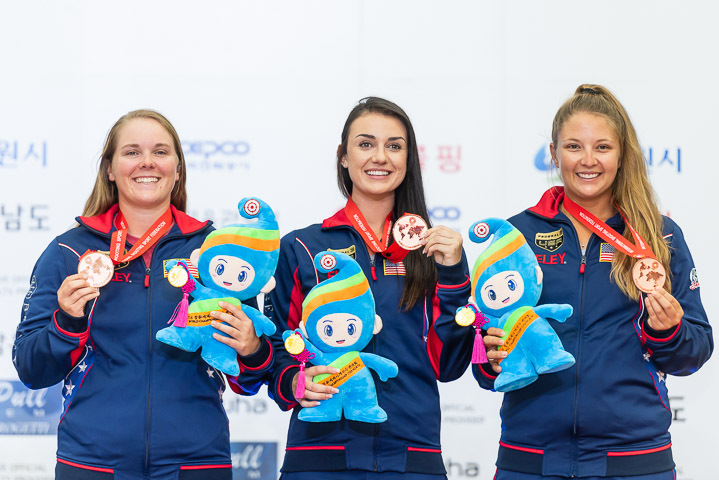 Ashley, along with Caitlin Weinheimer and Corey Cogdell, made up the team that took home the Gold Medal in last year’s Shotgun World Championships held in Moscow. The second to last remaining trap event kicks off at 7pm tonight with the Trap Mixed Team event. Tucson World Cup Gold Medalists Corey Cogdell and Jake Wallace will be looking for their first World Championship against the Tucson World Cup Bronze medal team of Kayle Browning and Will Hinton. See our viewing guide for the 2018 ISSF World Championships for times of finals and links as they become available.